Although this isn’t a long trail, it gains elevation fast. From the top of Francs Peak you’ll get some great vistas all the way north to Montana, south to the Wind River Mountains, west to the southern end of the Yellowstone Plateau and east to the Big Horn Mountains. This is big mountain country. 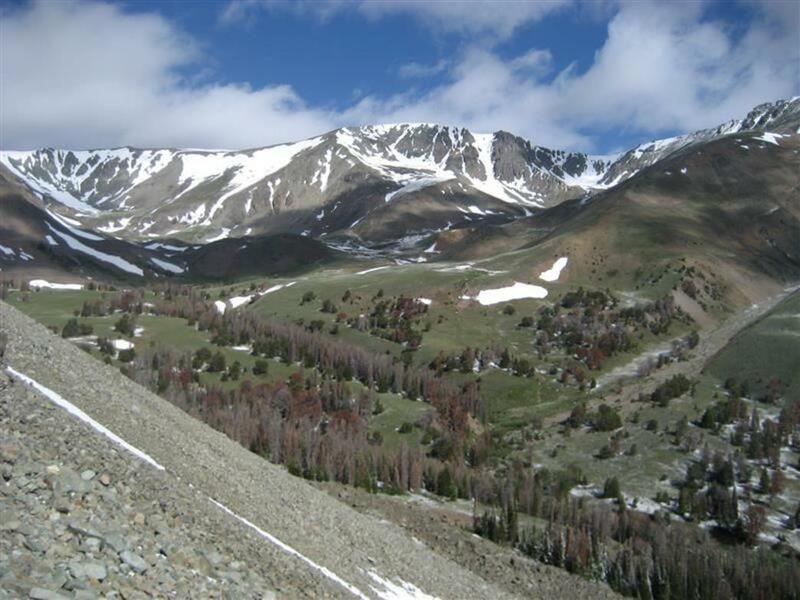 The Meadow Creek Trail is the gateway to the crown of the Absaroka Range, 13,153’ Francs Peak. The 3 mile trail takes you to Meadow Creek Basin then the climb to Francs Peak is an additional 4-5 miles.The forest is dense at first but you’ll soon climb out above treeline. Valleys, peaks, snowfields and grizzly bears make this a hike to remember. 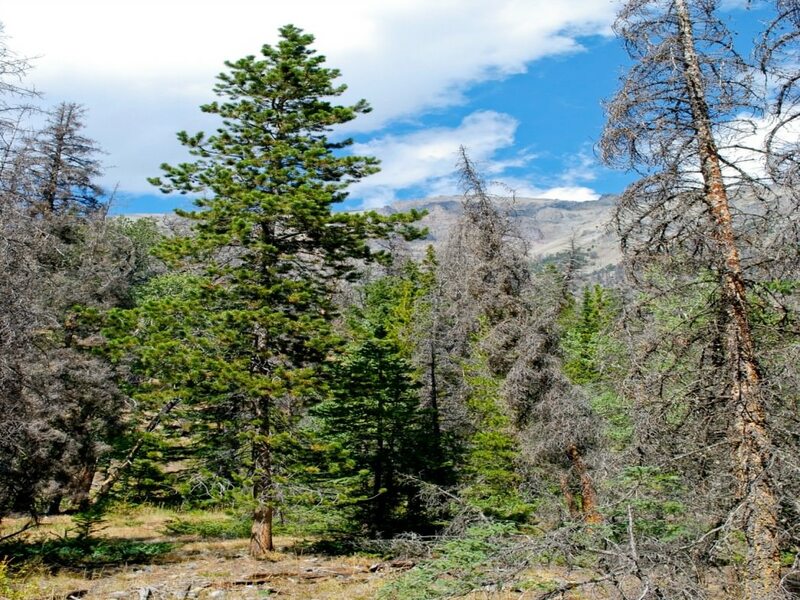 The Meadow Creek Trails takes you right to the boundary of the massive Washakie Wilderness. From the trailhead you’ll start climbing right away up a set of switchbacks through the trees. Catch your breath at 1.5 miles - you just climbed 600 feet. From here you’ll hike across a scree slope then enter Meadow Creek Canyon. The trail hugs the side of the steep canyon wall until you top out at Meadow Creek Basin. Take a congratulatory sip of water - you just hiked 1600 vertical feet in 3 miles. If you want to continue on to Francs Peak, look ahead and you’ll see a “green ramp” of vegetation leading up to the ridge that’s your highway to the summit. This is a popular hike on the weekends so know you won’t be alone on the trail. Due to the exposure you should be on the trail by 9 am and off before the afternoon thunderstorms start throwing lightning around. This trail is for peak baggers and anyone looking for a great workout. The trail is listed as difficult simply due to elevation gain, and if you’re from sea level you’ll definitely be sucking air. If the siren song of the high peaks calls you, this is your trail. You can camp at the Wood River or Brown Mountain campgrounds for a weekend adventure. Wildlife watching is a strong possibility in this area. Herds of elk or bighorn sheep might be out enjoying the high elevation vegetation. Late August you’ll see grizzly on the steep slopes of the peaks, flipping rocks as they forage for cutworm moths. Bring bear spray. From Cody, head south on WY-120 to Meeteetse. At 30.4 miles turn right onto WY 290. Head west on Sunshine Reservoir Road for 6.4 then turn left on the Wood River Road. Stay on the Wood River Road past where the pavement ends at 41.6 miles. At 52.6 you’ll see the Wood River Campground and then the Brown Mountain Campground at 55.0 miles. There will be three creek crossings which before July 4th might be a bit deep for a sedan. The Meadow Creek Trailhead is at 59.4 miles on the right. There’s room for about 4 cars. It’ll take about 1.5 hours drive time to reach the trailhead. Stop at the Meeteetse Museum to ask about road conditions. Cell service can be problematic in this area.